Everyone cannot imagine that when texting has invaded the mobile phones, it started with an unlimited sending with a very cheap monthly plan. Then came the metered plan charging each user at Php 0.25 per text message sent. Telecommunications companies were surprised of how Filipinos have embraced this texting phenomena that made us the texting capital of the world. Until these companies have thought of escalating the charge per text at 50 cents to a peso. In 2000, as world Internet and mobile phone users were discussing the next “killer app” in the form of a mobile instant messenger that might hopefully soon be created, a Manila-based company quietly released Chikka Text Messenger on beta. Chikka’s breakthrough was merging the IM technology seamlessly with SMS (short messaging system), and therefore offer users a better way to save on expenses because Chikka messaging system is free for all. Everytime a technology like this is created, I'm always in awe wondering "how could that be possible?" This new Chikka was introduced to the media in a gathering held last August 15, 2010. The event was hosted by actor Gabe Mercado. I was also surprised to know that Nico Santos, my former student in 2003, has been working for Chikka for more than 5 years now. And also to my surprise, Katt Blancaflor, a friend from the PR media company who helped organize the event, is Nico's batchmate in De La Salle-Zobel School. 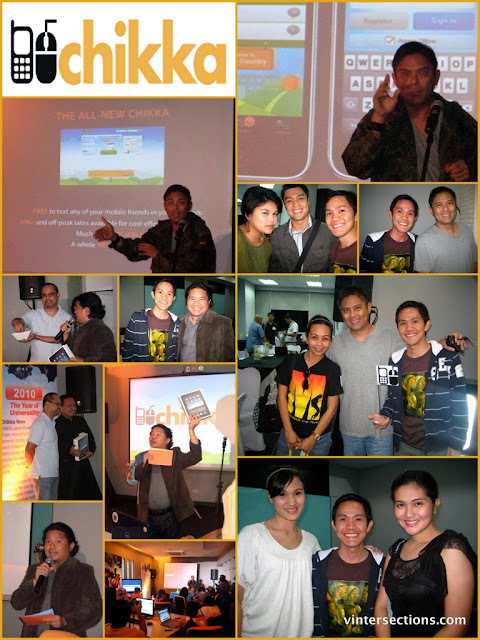 Ten years later, Chikka has served over 68 million people who had registered on-line and via mobile to enjoy the way Chikka had united on-line Filipinos with the sea of SMS users. The company is also releasing the latest version of its Chikka Text Messenger, launching it on August 25, 2010 (Wednesday). Today, a “digital generation” has emerged and 30% of Filipinos have Internet access taking part in social networks and becoming active in social media. Mobile penetration is closer to 80%. Mendiola said that natural disasters like the typhoon Ondoy and the national mourning for the passing of former President Cory Aquino awakened us on our need for Internet and mobile tools to relay information and and to mobilize relief operations. Thus is setting for Chikka latest version release. “Chikka is more relevant than ever. We observe for example that a lot of casual messaging previously exchanged via text has shifted to the social networks. Our latest version is being released, combining the cool convenience of sending an IM message when one is on-line with the personal warmth, immediacy even urgency of receiving a message as text, instantly read on ones phone,” Mendiola added. Promoting even higher utility for the community, the new Chikka version features P1.00 replies during off-peak hours when a lot of Global Filipinos are driving message traffic to friends and loved ones mobiles in the Philippines. Unlimited text packages akin to popular UNLI packages being offered by Philippine telcos are also now available all day. According to Mendiola much of the work that went into the “new Chikka” actually happened in the back-end with a "major major" redesigning. This allows the company to pursue a technology roadmap that will very soon enable Chikka for any platform and operating system, for any IM aggregator, and also for any mobile device. A third party developer has released an iPhone App. Chikka for its part is set to unveil its own app for the iPhone, as well as Blackberry and Android devices. We can now use Chikka on any communication platform. We just need a computer or a mobile phone.